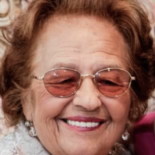 Rosaria Napolitano | Lloyd Maxcy & Sons Beauchamp Chapel, Inc.
Rosaria (Sarina) Napolitano,91, of Greenwich CT passed away on Jan 23, 2019. Born in San Fili, Cosenza, Italy on June 7, 1927 to the late Michele and Maria (Carpanzano) Gentile. She came to the United States in 1955 with her family to start a new life. She was a long time resident of New Rochelle. Sarina worked as a seamstress at IMP Original for many years. The light of her life was her family. She is survived by two daughters, Gina Landi ( Joseph) and Mary Ciancio (Tony), her beloved grandchildren, Maria, Louie, Rosa, Laura, Dawn, Christopher, Vincent, Anthony and Justin, and great grandchildren, her sisters Anna and Vera, her brothers Frank and Mario. She was predeceased by her husband Francesco, her son Carmine Napolitano, brother Anthony Gentile and sisters Nella Passarelli and Josephine Oliva. Selfless and generous, Sarina devoted herself to her family. She was a true giver in every sense of the word. Her faith was deep and powerful. She will be deeply missed. Visiting will be Friday from 4 to 9pm at Lloyd Maxcy and Sons Beauchamp Chapel Inc. 16 Shea Place New Rochelle NY. A funeral Mass will be on Saturday at 10:30am at Blessed Sacrament Church. Interment will follow at Holy Sepulchre Cemetery.